OSSDSIGN® Cranial PSI (patient-specific implant) represents an innovative and insightful approach to cranioplasty. Uniquely designed for every single patient, OSSDSIGN Cranial reconstructs the skull defect, protects the brain and enhances the patient's cosmetic appearance. Delivered sterile and ready to use, in any size* or shape desired, it provides a solution for a variety of cranioplasty needs. Conventional cranioplasty using autologous bone and traditional synthetic implants pose a number of substantial risks and complications including resorption (autologous bone), infection and protrusion. 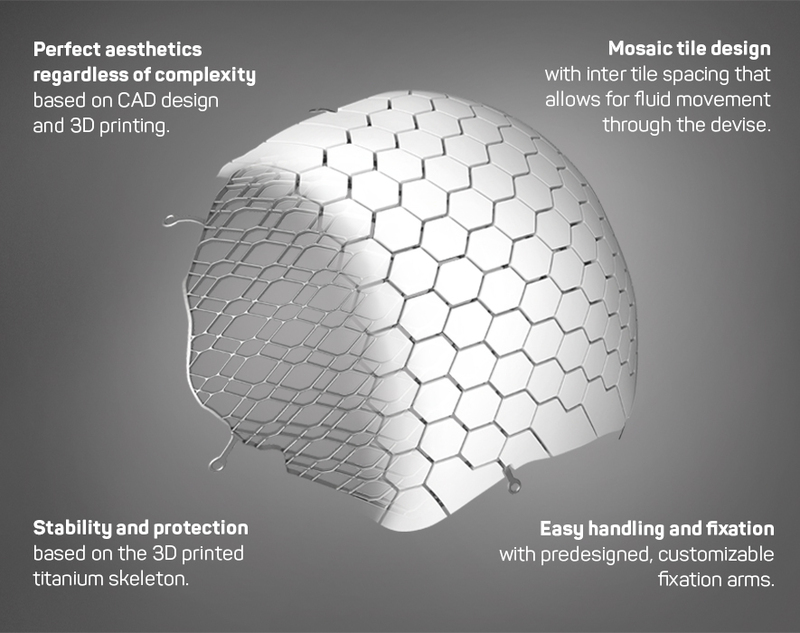 OSSDSIGN® Cranial is a patient-specific implant based on a biocompatible calcium phosphate composition with a strong titanium skeleton embedded in the core of its' ceramic tiles. OSSDSIGN® Cranial PSI is intended for the reconstruction of cranial defects. It is indicated for non-load bearing applications for patients in whom cranial growth is complete, and for use with an intact dura, with or without duraplasty. The design of OSSDSIGN® Cranial is based on a series of titanium-reinforced calcium phosphate tiles. An OSSDSIGN® Cranial implant can withstand at least the force of a standard titanium mesh before being deformed. OSSDSIGN® Cranial is composed of OssDsign's biocompatible calcium phosphate-based ceramic material. It is designed as a set of interconnecting tiles with inter-tile spacing that enables fluid movement through the device. OSSDSIGN Cranial is easy to fixate to the skull with standard micro screws through the pre-designed, low-profile fixation arms. The titanium skeleton is embedded in the core of the implant's ceramic tiles which are manufactured, cured and immobilized - ready for surgery. The OssDsign CAD-design team have extensive experience in designing implants for cranial defects of various complexity. During the design process we work in close collaboration with you to ensure that we achieve an optimal solution for you and your patient. Copyright © 2017 OssDsign AB. All rights reserved.